It can safely be said I was quite a sickly child, whatever went around I caught, my sister on the other hand was never ill, it was always me. It was tonsillitis that was the bane of my life as a young child, it seemed to come around every couple of months and instead of school, I would be sent to my Nan’s whilst my parents worked. Eventually it was decided that I would have my tonsils removed. In the late seventies and early eighties it was, I guess, common practice to just send every chronic suffer to have them removed, nowadays they aren’t so keen. So on Sunday 21st September 1980, I went in to Newark General Hospital, the day before my operation was scheduled. There were three other boys having their tonsils out and also a young girl who was having her adenoids removed. We were all of a similar age and seemed to get on, except the young girl who was rather loud and annoying! On Monday afternoon we were taken upstairs to theatre and one by one we were all operated on. I remember waking up and just coughing up blood, all we were allowed to eat for the first few days was ice cream! On the following Thursday we were discharged and my parents were told I was not allowed out of the house for two weeks, for risk of infection. Whilst I was house bound, my cousin, who was four years older than me had started karate at the local sports centre. On the first Sunday that I was able to leave the house, I went to watch him. At that time in 1980, karate was only just becoming the family activity it is now, beforehand it was just a battleground for grown men, but now more and more clubs were inviting kids to join. The club in Newark at the time had an age limit of seven years old, at that time I was still only six, just two months before my seventh birthday. So on Sunday 12th October 1980, I went along to watch my first class. I remember sitting on the bench at the side, just watching and then standing up and trying to replicate what the kids and their parents were doing. Then about half way through the class the instructor came over to my Dad and me, he had obviously seen that I was trying to do karate too, he asked my Dad how old I was and when he told him that I was still just six, but only a couple of months from being seven, the instructor paused for a moment, then decided I could join in, he invited me to join the rest of the class and off I went, shoes and socks off and I joined in. As a child, or being honest here as an adult too, I was very shy. I didn’t make friends easily and didn’t speak with people I didn’t know. If I was with my parents and they stopped to speak with someone they knew, I would hide behind them, unless I knew them, but generally I was very shy and quiet. I was more than happy with my own company. So karate was a big step out of that bubble for me. The instructor, Alan, was a hard but fair man, he pushed us, sometimes maybe too hard, but that was because he wanted to get the best out of us and generally only the ones that really tried and he thought had potential. In those early months, I’m not sure what he saw in me, I tried, I really did, I was a trier, if I was doing it, I was all in, doing the best I can, but the honest truth was that despite all my efforts, I was rubbish, my natural shyness didn’t help either, I guess it stopped me performing at times and also if the instructor raised his voice, I would probably break out into tears, I did many times and generally it wasn’t because he was shouting at me either, I was just that sort of kid that would cry at the drop of a hat, I was shy and I was emotional, I guess I still am, just ask my Connect Group! After five months for training, it was time to take my first grading, I had never met a Japanese person before, Kawasoe Sensei was quietly spoken, but a very good technician. I don’t really remember that first class with him, I remember it being a Saturday evening, as was the normal for grading back then, eventually they would move to Sundays, but that would be a year or so later. I think that Sensei would come up from London, take a session and grading in Newark on the Saturday and then travel on Worksop to do the same on Sundays, although I may be mistaken. I have a vague recollection of taking that grading, but what I do remember is the result and what my instructor told my Dad afterwards. It was very rare a student ever completely failed a grading, they would have to be clueless to do that and lets be honest, if they were clueless, they shouldn’t be taking the grading in the first place. I don’t think I was clueless, I just wasn’t very good, my instructor told my Dad that I got the turns wrong in my kata, essentially the first kata is a twenty simple moves and a handful of turns, the turns are the only thing you really have to get right! In addition to that I didn’t kiai during my grading either. The kiai is a shout of spirit, it should be done at the end of every set of basics and twice during the kata. I think I may have kiai’d during the grading, but knowing me and how shy I was, it was more likely that I just mumbled something under my breath, rather than let out the shout of spirit that was required. As I say, it was pretty rare to see anybody fail at the first grading, it still is, but there is what is called a temporary grade, the student still gets to wear the belt they were grading for, but as they are not quite up to standard, they could just be made up to a full grade the next time, unless they significantly improve. I got a temporary grade that day, 9th kyu as it was called. These days we give out a bright orange belt to new 9th Kyus, back then though, there was no such thing, we kept the same shabby, fraying canvas white belt and my Dad wrapped a piece of black electrical tape around each end, that signified 9th Kyu, the next belt should be what is now red, but back then a second tab was added, it was all a bit basic. I laugh now when I think back to that first grading and my early days of karate, the thing I couldn’t do back then, is what I now have a reputation for, I couldn’t do my kata, as time went on I would become Regional kata champion, eventually National kata champion and represent England in kata on five occasions, but back then I couldn’t do it for toffee. It does however make a good story for my students these days. When I can see they are struggling with their kata, learning new ones and not getting the right, I tell this story, of the little shy boy, that couldn’t do his kata, that got that temporary grade like some of them, I wasn’t very good, I wasn’t natural at any of it, I worked hard though and in time it came to me. The young kids look at me in disbelief, they can’t imagine that I would have been that bad, I tell them I was a lot worse than they are, then watch as they relax and things begin to fall into place. That early disappointment wasn’t a setback, it was just a start, I was too young and didn’t really understand what it meant for it to be a setback, I got the belt, so everything was fine, it was now on to the next grading. But there was a setback to come. Back then I idolised my cousin, we weren’t a very well off family, most of my clothes and all of my bikes at that point had been hand me downs from my cousin, needless to say, he was four years older and generally bigger than I was, I was very small for my age, well below the average height, indeed at 5ft 4½ inches, I am still very short (needless to say the ½ inch is very important), so the clothes I got from him were too big and by the time I grew into them, they were well out of date! Some weeks after that grading, my cousin decided one Sunday that he wasn’t going, we only trained once a week at that point, but the classes were growing by the week and soon a Tuesday evening would be added, but my cousin said he wasn’t going, so I wasn’t going either. The same thing happened the next week and then the week after that, it happened for about six weeks, then my cousin said he didn’t want to go anymore, so naturally, as I wanted to do everything he did, I told my Dad I didn’t want to go anymore either, my Dad wasn’t very happy and I didn’t understand why. I had no idea how much it cost each week, how much the karate suit cost, the license and the grading, I didn’t understand any of that, I had no concept of money, I didn’t get pocket money, I did karate and that was it, so I didn’t understand until years later why he was unhappy that I didn’t keep going. He hardly spoke to me for the following week, until on the following Saturday, I asked my Dad if he would take me to karate the next day, I remember the light in his face when I asked him. My Dad worked three jobs most of the time when I was younger, he worked at the local factory during the week, two weeks on days and then two weeks on nights, then the weekends he would work with a friend of his at a Garden Centre in Southwell, the friend he worked with also did karate and around this time had just received his black belt, apart from Alan, the main instructor he was one of two that past that day to become the second black belts from the club. In addition to those jobs, my Dad would finish work early and then go and work for an hour or so at the D.I.Y. store my Mum worked at in town, he would just help in the mill cutting wood and then would come home with my Mum, so unless I went to the Garden Centre with him on a Saturday, which I did from time to time, I didn’t get to spend that much time with him, he worked so we could have a nice home and nice things. I had been born into a family that was living in a Council Flat on Grange Road and by now my parents were working hard to buy their first house, it was a council house that we had moved into, but my parents had purchased it and were working to do it up and pay the mortgage, as well as give my sister and myself everything they could afford, so when I said I wanted to go, I realised this was something that he wanted to do for me, to support me in, he knew I liked it, I knew I was a trier and the instructors there had taken to me, whether I was pretty bad at it or not, he wanted me to succeed. So I went back and started training once again, preparing for that next belt. By the time I took that next grading, the belt system had changed and the 8th Kyu belt had now changed from the old white belt with two tags to the red belt, although the 9th Kyu belt would remain white with a tag for a while to come. Back in those days it was popular to just dye belts, I guess it was expensive then to buy belts, karate wasn’t as popular a pass time as it is now, so belts weren’t available everywhere like nowadays, so my Mum decided to dye one of the white belts I had, I had two now, because I had inherited my cousin’s after he quit, she purchased the red dye, followed the instructions the evening after my grading. I still had only a temporary 8th Kyu, I was good enough to complete my 9th Kyu belt that was a temporary grade from before, but still wasn’t quite good enough to get a full red belt, so it was temporary again. The only problem was that she dyed it that Saturday evening after the grading, but it came out pink and she had used all the dye, the Sunday was normal training at the club and well, I went with my pink belt. There wasn’t many people at the class and with it being July, the class was held on the playing fields behind the sports centre. My Dad took his camera that day and somewhere there are pictures of me in pink belt, beating up Fraser, one of the adult brown belts who would help out at the kids classes on a Sunday afternoon. Needless to say the next day my Mum purchased some more dye and re-dyed it, it came out a dark crimson red, that was fine for me. After that grading I never wore a dyed belt anymore, it was a purchased belt all the way. have you come to get me back on track? if you weren’t here to pull me out? If I didn’t have my friends? This entry was posted in Karate and tagged Beginner, Grading, History, Karate, The Fight, THe Rocket Summer on October 12, 2015 by waynemali. The Church I attend is called Everyday Champions Church, that was the Church I walked into on the 1st April 2012, just three days after finishing my last drink. We have a motto as such which is “There Is More In You Than You Think”. Over the last few weeks in our Connect Groups we have been discussing what it means to be an Everyday Champion, what it is that drives us on to be the best we can be. A couple of weeks ago in our Group, my mind was drawn back to a comment I had heard, a quotation that a famous Karate Instructor had said and when I went away to find the actual quote, I came across a story I had heard before, but now found more relevant than ever. Back in 1957, the Japan Karate Association organised the first All Japan Karate Championships, which was probably the first Nationally organised karate competition in the world. One student, Kanazawa Sensei was training for this competition, until just four days before he broke his right hand training. The J.K.A. withdrew him from the competition because of the injury. His mother had travelled to Tokyo to watch her Son compete, when she arrived he told that he was unable to compete due to the injury to his hand, but she didn’t understand why he couldn’t. He tried to explain that he wasn’t allowed, due to the injury and she questioned him further. She asked if he only used his right hand, didn’t he have another hand and two leg also, couldn’t he use them? She told him to go back to the J.K.A. and ask to be allowed to compete. The J.K.A. eventually agreed, on the provision that he had a doctor with him that would take responsibility for the injury. So he went along to compete, hoping to win just one fight for his on looking mother. In the competition he used his left hand to block his opponents and counter with kicks, he won his first fight, then another and another, until he made the final. 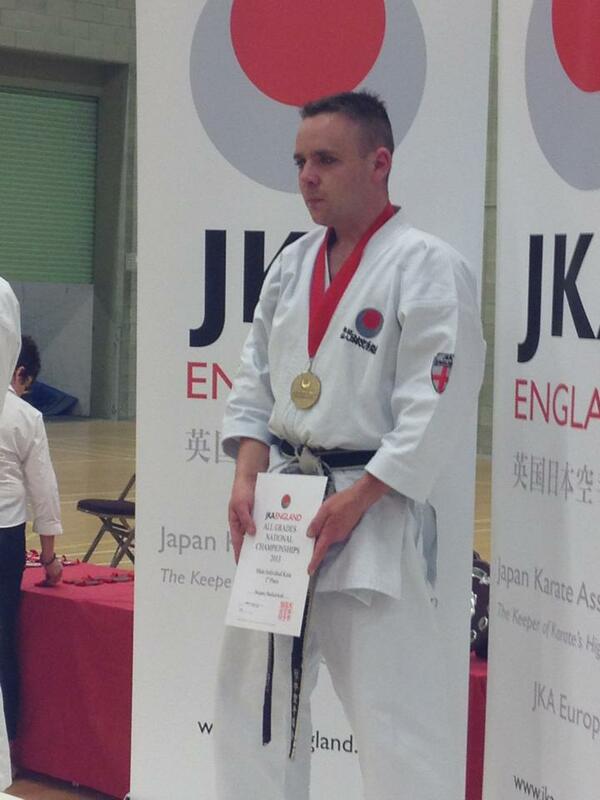 In the final he once again used his legs to score the points that saw him crowned the first All Japan Karate Champion. Years later he travel to England to teach, he was introduced as a Champion of all Japan and students would congratulate him on becoming champion, he would usually respond with “Thank you but please remember that I was only a karate champion for that one day, what about all the other days of the year?” Then he would say. “Karate is not just about being a champion on one day of the whole year but karate is about how hard you train in order to perfect your karate and yourself all the time, for every day, not just one”. The story of that first karate championships is a great example of how we think. He only saw what he didn’t have, concentrating on what he had lost, his mother looked not to what was lost, but made him look to what he had, to use that and go out and win, she changed his thinking and his mentality. We see a parallel here with many stories and heros of the Bible, the likes of Moses, when God instructed him to lead the Isralites out of Egypt, he saw his inability to speak as a reason he couldn’t do it, but God saw the heart inside and sent Moses anyway, sending Aaron to speak for him, God saw what Moses did have, rather than what he was lacking. In Jeremiah 1, we see the same issue, God instructs Jeremiah to go out to be a Prophet among the Nations, but Jeremiah responds with what he does have as an excuse, “Ah, Lord God! Behold, I do not know how to speak, for I am only a youth.” God sent him out anyway, seeing what Jeremiah had rather than what he lacked. Kanazawa strove to live out this code in his daily life, not just a champion for that one day, but to live as a champion everyday. Unfortunately these days we see too many champions of sport, not just karate, who fail to live this way, though they train to win on that one day, the rest of the time they unfortunately fail as human beings, consumed by success and riches gained, rather than living the real life of a champion. We see in David, a champion on the battle field who strove to live the life of a champion everyday. We see when he accepted the challenge of Goliath, it was those around him that saw only what he didn’t have, they saw him as young and small, inexperience and not a warrior, they didn’t see what David had. Even Saul didn’t see what David had, otherwise he would have taken the challenge himself. We don’t see Saul get down on his knees and pray to God, he was the King of the Israel, yet he never saw what he had on his side, only what he didn’t. David on the other hand knew he had God with him, he answered Saul’s doubt with “The Lord who delivered me from the paw of the lion and from the paw of the bear will deliver me from the hand of this Philistine.” He knew he had God with him, he had all he needed and as we know he defeated Goliath. We are all guilty of seeing what we lack, me included, I see everything I don’t have as a reason not to be the person God made me to be, I see all that is wrong with my life, forgetting about all that I have and what God has given me. I may have overcome so much, but there is still much I am afraid to do, because I have fear in what I don’t have, rather than confidence in the God I have with me always, I just need to keep believing, like David, that the God that has delivered me from so much, will deliver me in all the battles I face. What is it that you see as a reason not to face the challenges before you? What is it that you don’t have that stops you from competing? What is it that you believe you don’t have that stops you being a champion everyday? For we all have God with us, in every battle, in every fight, so what is it that stops us living as a Champion? This entry was posted in Faith, Karate and tagged Bible Verse, Champion, Chris Tomlin, Christ, Everyday Champions Church, Faith, Fear, Freedom, God, Grace, Hope, Inspiration, Jesus, Karate, Overcome, Strength, Whom Shall I Fear (God Of Angel Armies) on October 8, 2015 by waynemali.